Samson Awnings are one of the UKs leading specialist suppliers and installers of domestic and commercial awnings and outdoor cover systems in the Cambridgeshire and surrounding area. We have traded since 1994 and are part of a larger group of companies also specialising in high quality building and security products for the home and industry with extensive experience and knowledge in fabrication, groundworks and assembly of large framework systems. We have a large showroom in Wellingborough, Northamptonshire with fully operational awning models inside and outside, the latest terrace covers and retractable roof systems, fabric samples and professional knowledge from our experienced sales department. We welcome you to enquire about any details you require and will gladly provide you with a free survey and prices. 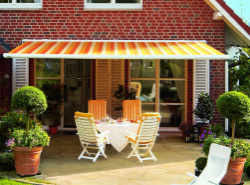 Retractable awnings let home owners control the great British weather on their own terms. When passing showers threaten in the summer and Autumn, or when the sun gets too hot, they or the intelligent home automation systems available unroll the awning for protection and shade. It has been shown that it can be as much as 20 degrees cooler under an awning’s canopy. Because awnings prevent the suns rays from shining through windows and sliding glass doors, they can keep temperatures inside cooler as well, which saves on air-conditioning costs and they can help prevent carpets, rugs and furniture from fading in direct sunlight. Awnings also provide a sheltered place for your children and pets to play, shielded from direct sunlight but also protected from rain with certain awning models. Some of the more recent developments in awnings provide accessories that can greatly increase the versatility and usefulness you can get from your deck or patio. A screen room add-on can easily turn an awning into a virtually wind free outdoor room, side screening cuts down on wind and mist coming under the sides of awnings, and patio lights let people enjoy their decks evenings and nights. The supported awning using an aluminium framework allows even further extensions of the fabric to a maximum of about 6 metres and also means the awning can be left out in higher wind speeds and rainfall too. Systems such as the Markilux Pergola or the Weinor Pergotex will achieve far greater outdoor area use most of the year round. Samson Awnings & Terrace Covers specialise in the sale, supply, installation and servicing of patio awnings and supported retractable roof systems offering higher levels of wind and rain protection than most standard awnings can. All of the Cambridge Patio Awnings we supply are fully retractable and are available with full cassette, semi cassette or open cassette covers to protect against the sun. 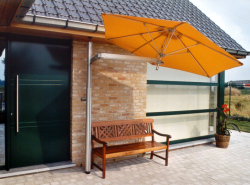 This enables you to enjoy the shade and shelter which a patio awning provides. Whilst being able to effectively offer sun protection, our patio awnings are available with a variety of different material covers to offer effective shade against sun glare and the rain. 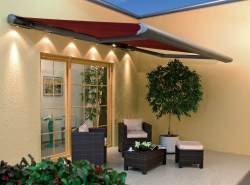 A waterproof patio awning allows you to remain outdoors even during rainfall keeping you and your patio area dry. We only deal with manufacturers and models of the highest quality to ensure that the best performance possible is provided for many years to come and that you remain deeply satisfied after dealing with us. A properly specified and installed Sun Awning can make the difference between a relaxing, beautiful outdoor space and an area spoiled by a powerfully strong sun or even light rainfall in the summer or autumn months. Samson Awnings & Terrace Covers supply and install a range of sun awnings suited to blocking out the powerful heat from the sun without losing the natural light. We also offer awnings quite capable of dealing with rain and higher wind speeds than most normal basic awnings. Terrace & Patio Covers are the ideal solution to all weather protection for both domestic and commercial environments. 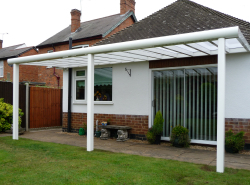 With their unique adaptability, our solid structure canopies can be installed almost anywhere and everywhere. No product demonstrates this more than our Samson SupaRoof Patio Cover System. Our Large Umbrellas & Giant Parasols are some of the most highly engineered products on the market. We supply and install a range of high quality umbrellas capable of spanning up to 70m² in one umbrella!! Join more than one together and you can cover vast areas for commercial or domestic use. We specialise in the supply and installation of two main types of large umbrellas & giant parasols. The new range of May umbrellas manufactured in Germany offer some very interesting solutions, even providing an electric operated umbrella system!! Cantilever Umbrellas offer more useable room underneath the fabric canopy as they have a side-arm construction which allows them to offer practical shading over an area without the obstruction of a supporting pole. Our main manufacturers for these include Paraflex and May umbrellas. 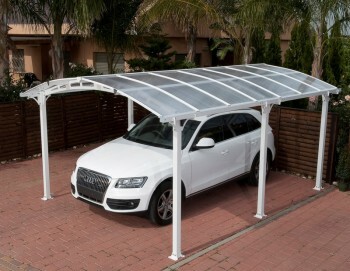 vary in size from small Carports, medium sized Carports all the way to infinitely sized Carports thanks to their unique ability to be coupled together multiple times. Samson Awnings use only high quality manufacturers to provide the optimum level in performance, durability and comfort for your money. Each manufacturer we deal with are tested first and all our products are sourced from UK or European manufacturers and we only supply and install the highest quality products available at any time.